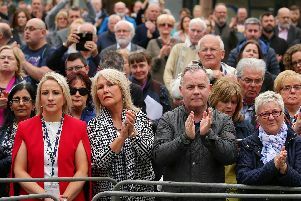 A former RUC Special Branch officer has said many former police officers and innocent victims of terrorism will be “disappointed and confused” with the chief constable and police ombudsman after their comments about collusion yesterday. Dr William Matchett was speaking after George Hamilton told a Queen’s University conference that the issue of police colluding with loyalist paramilitaries “was much bigger and more complex than the ‘few bad apples’ analogy that has been articulated previously”. Addressing the ‘Victimhood and Dealing With The Past in Northern Ireland’ conference yesterday, Mr Hamilton said the outcome of a number of ombudsman reports, public inquiries and judge-led review tell us “that policing in the past was not always as it should have been”. Dr Matchett, a former agent handler, said: “‘Collusion’ is the language of ‘armed struggle.’ It should be contested, not reflected. “Today, it is common legacy language. The ‘c’ word conjures up images of bigoted cops plotting with loyalists to murder Catholics. “In speaking at Queen’s University on legacy, the Police Ombudsman and chief constable talked extensively on ‘collusion’ and from different directions seemed to say that it was bigger than previously thought. “The Ombudsman talked of evidence, precisely what his office has failed to produce in order to prosecute a single police officer for the serious crimes ‘collusion’ heavily implies. I assume the same paucity goes for the chief constable? During his Queen’s University address, Mr Hamilton said: “Although there is no agreed definition, the term collusion signals malevolent intent. Intent is an issue that is rarely discussed in all the public debate on collusion. The chief constable said the majority of people who choose to become police officers do so “to protect life,” and that the RUC was no different. “They served with great integrity and they sought to protect life and to protect the community,” he said. “The environment in which they worked was chaotic – terrorist attacks were happening on a daily basis, and many lives were being lost. However, Mr Hamilton added: “But they were, on many occasions, decisions and judgements that should not have been taken; and, I believe, would not have been taken if there had been a proper regulatory framework in place. Sharing the same platform, the police ombudsman Dr Michael Maguire said: “Put simply – there is no collusion lie – it did exist, people died and others escaped justice as a consequence. There is too much evidence to suggest otherwise. “To suggest that simply because no officers have never been prosecuted means that it didn’t happen, doesn’t make sense to me and is contrary to the evidence I, and significantly others, have seen and reported on.